As I waited for the Jungceylon mall in Phuket, Thailand to open, I scoured the food establishments in front that were already taking in customers. I've always been a fan of Au Bon Pain and now, more than ever, because of their delicious Iced Chayen. Iced Chayen is also known as Thai Iced Tea. It is usually freshly brewed and mixed with condensed milk and heaps of ice. Au Bon Pain used powdered tea for my drink, which I didn't mind. The lady at the counter asked me if I wanted mine ice blended or iced. I've never tried ice blended Thai Iced Tea, so I went for that option. Think Frapuccino, but Thai tea. The result was a cool, creamy tea shake with a familiar taste but nice twist. 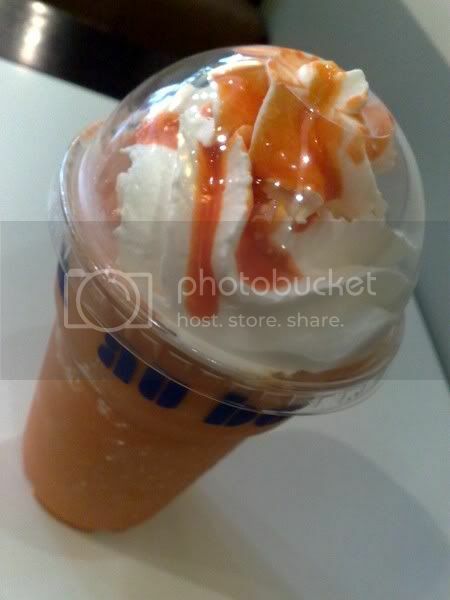 It was served with whipped cream on top drizzled with Thai tea syrup. Words cannot express my envy, awe and arousal right now.